Kolorco were approached to produce the 20th Anniversary Brochure for an agency. The book celebrates their 20 years of partnership with M&S. Kolorco has a comprehensive range of short run digital and sheet fed lithographic print capabilities. With a wide range of capabilities Kolorco is ideally qualified for this type of work. 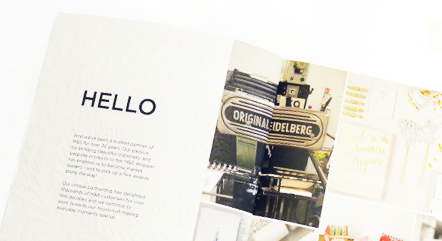 The inner pages were printed digitally using our superior HP Indigo technology; whilst the size of the cover meant that only a larger format litho technology could be used. To give this book a high-end luxury feel the cover was embossed with a leaf motif and then hot foiled stamped in a Metallic Rose Gold.